Each year (middle of September), everyone in Urmston is invited to create a Scarecrow, for public display! (It is organised by the Facebook Group: Urmston Partnership). Anyone can enter…..you just have to notify the Facebook group to make sure your entry is listed for ‘the World to see’….and maybe win a prize! (but I don’t suppose it really matters if you don’t). Its a fun thing to do for everyone, especially during the August bank holiday weekend! This year we decided to make a fisherman. My friend gave me her Uncles boat when he passed away, hoping we could make use of it. 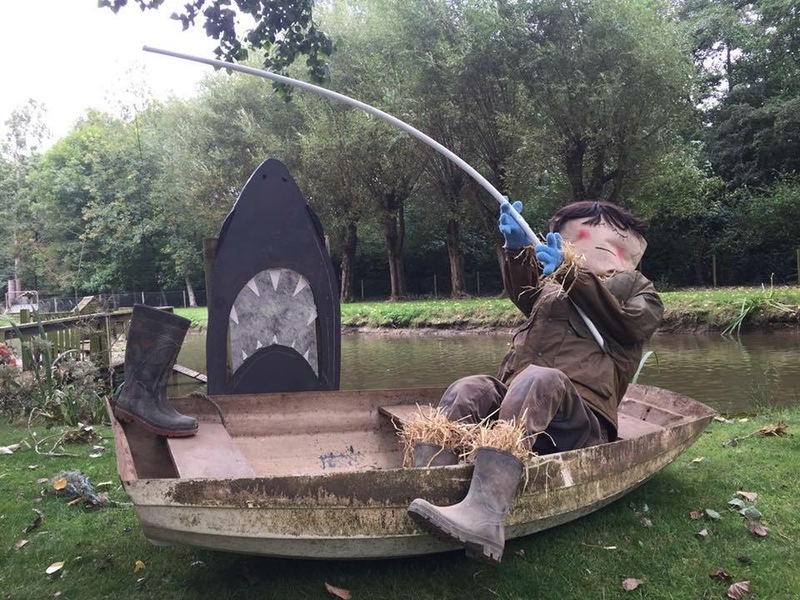 I am pleased to say it has come in very useful as a boat and thought we would now show it off in the Scarecrow Festival. I’ve sent her a postcard with it on as a nice memory for her too. Hopefully it made people smile as they walked the dogs (and children) on the meadows! This was displayed in our garden, and could be seen from the meadows (enter at the corner of Southgate/ Riverside Drive….on the left approx. 200 metres down the path).